In 1900 the Duluth News Tribune poetically described Minnesota Point as “a penciled eyebrow on the face of nature.” Since the establishment of Superior, Wisconsin, and the townships that make up modern Duluth, residents of both cities, along with thousands of visitors, have taken advantage of this narrow sandbar as a delightful summer resort—a place to picnic, camp, swim, and play on the Lake Superior shore. Minnesota Point is the northern portion of the world’s longest natural sandbar, which formed over the last several thousand years at the place where Minnesota’s St. Louis River and Wisconsin’s Nemadji River meet the waters of Lake Superior. As the sand and silt carried by the flowing water was deposited, it built up a narrow barrier that shelters the bay behind it from the wind and waves of Lake Superior. The same natural processes that formed the sandbar also cut it into two sections: Minnesota Point makes up the northern seven miles, Wisconsin Point the southern three miles. When European explorers first came to the area in the 1600s, there was only one opening through the sandbar—the natural gap between the two points, now the location of the Superior entry. Prior to the increasing westward expansion of the United States, both Minnesota Point and Wisconsin Point served as summer gathering spots for generations of native peoples, a tradition that continued with the Ojibwe in the 1850s. After the 1854 Treaty of LaPointe opened land north and west of Lake Superior to settlement, pioneers moved in quickly. Between 1856 and 1859, they established eleven townships on the Minnesota side of the lake, including several along Minnesota Point. Near the northern end of the point, early settlers platted Duluth Township. Further down the point, Robert Reed and T. A. Markland platted a township that extended from today’s Thirteenth Street South to Thirty-ninth Street South. They called the fledgling community Middleton and set aside a parcel of land for an open public space called Lafayette Square. Another open space, Franklin Square, was platted at Middleton’s northern border. (See “Nineteenth-Century Squares” for more information.) The federal government owned the remaining land on Minnesota Point south of Middleton; known as the Barrens, this long stretch of sand and pine forest extended to the Superior entry. A platform for dancing, over which a broad canvas spread its protecting wings, was erected nearly opposite the town [Superior], and swings were suspended from the overhanging trees. At evening parties of ladies and gentlemen visited this shore, crossing the placid waters in boats and canoes, to the music of flutes, violins, and guitars, mingled with the voice of song. 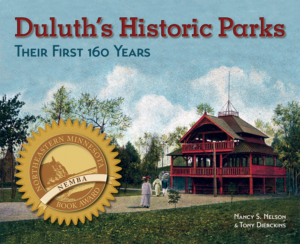 In March 1870 the townships, including those on the point, combined to form the City of Duluth. The next spring the city completed the first cut of a ship canal through Minnesota Point along Portage Street; the following spring the canal was complete, but it had turned the point south of the canal into an island. The citizens of Middleton lobbied hard for a bridge over the new waterway. A temporary bridge was built for use during the winter when shipping traffic was halted. But life for those living south of the canal became complicated. The Financial Panic of 1873 caused great economic hardships in Duluth, and in 1877 the city lost its state charter. Many of the original townships then reverted to independent status, but Middleton and others stayed with Duluth Township to form the new Village of Duluth. In 1881, with no bridge in sight, citizens living south of the canal—the area now collectively called Park Point—had had enough. That March state legislation turned the community of Middleton into the independent Village of Park Point. When Duluth returned to city status in 1887, Park Point refused to rejoin until they had a more convenient way to cross the canal. Duluth promised a bridge, and in 1889 Park Point rejoined Duluth. The bridge, however, wouldn’t arrive until 1905. 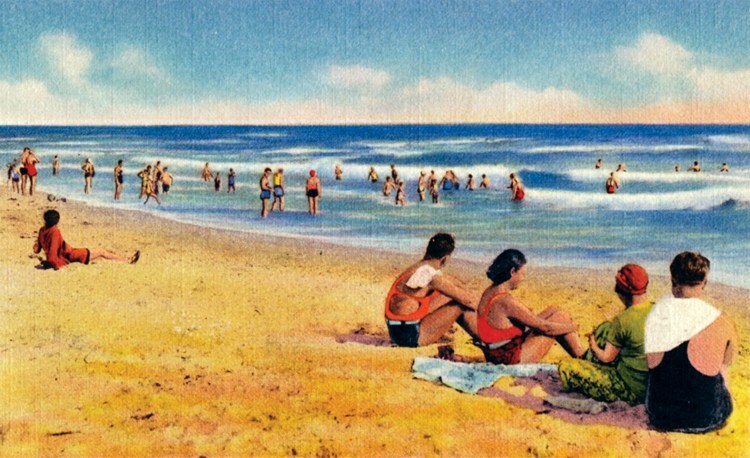 Picnics at Oatka Beach remained popular through Duluth’s tough financial times and the boom period that followed. According to Minnesota streetcar historian Aaron Isaacs, the Minnesota Point Street Railway (MPSR) Company started operating a horse-drawn trolley on the Point in 1889 or 1890. Described by the News Tribune in 1894 as “old fashioned and slow,” the trolley carried passengers three miles from the canal to Oatka Beach. There visitors took advantage of the picnic grounds and swimming beach and enjoyed band concerts and dancing in the Oatka Beach Pavilion. Newspaper ads announced other special events, such as Signor Levenso, who in July 1890 gave two daily performances of his “startling and wonderful acts, the aerial flight or the slide for life, and tight rope performing 100 feet in mid-air.” On Sundays, the clairvoyant Madame Johnson was available to read the past, present, and future. Picnickers began to prolong their visits by setting up tent camps all along the point, from the canal to the Barrens. Duluthians and Superiorites alike used the point as a place to relax or recreate for an afternoon or camp for an extended period of time; the more affluent stayed for the entire summer. Near the southern end along the Barrens an enclave of cabins first built in the 1850s for wealthy Superiorites clustered around what later became known as Peabody’s Landing. In the great majority of cases no inquiry is made as to the owners of the lots on which the camp is pitched, and the owner makes no inquiry as to who camps on his lot… Some campers own lots, and others have permission to occupy the lots on which they are located… Others occupy several lots. Once the trolley began providing easier conveyance along the point, entrepreneurs established enclaves called Hay Fever Havens—clusters of cabins inhabited by those who could afford to summer in Duluth to avoid allergens in their own towns (antihistamines were a long way off). Similar facilities sprang up along Lake Superior’s North Shore and on Isle Royale, but Duluth was the most accessible of these pollen-free locations. In 1900 Duluth became home to the Hay Fever Club of America. The MPSR changed hands in 1896 and in 1898, under new owners, became the Interstate Traction Company (ITC), which electrified the car line. The streetcar line was extended four blocks in 1902 after Charles F. Hartman—one of the principle owners of the ITC—purchased the Oatka Beach property and platted the Oatka Beach Addition, which was intended as a new residential section between today’s Thirty-ninth Street South and Forty-fourth Street South. The 1.5-acre block between Forty-third and Forty-fourth Streets South was dedicated as Hartman Park.